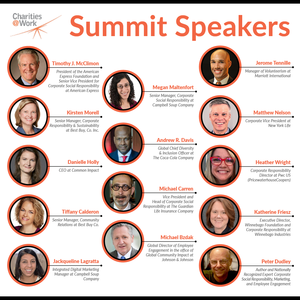 ALEXANDRIA, Va. , May 23 /CSRwire/ - The 17th annual Charities@Work Employee Engagement Summit program June 27-28, 2018 in New York City will focus on tackling social issues and igniting employee activism, driving greater social impact through innovative nonprofit partnerships, aligning employee engagement to corporate purpose, and engaging hard-to-reach employees through skilled volunteerism. This unique Summit brings corporate social responsibility (CSR) leaders together to share trends and new ideas as well as drive greater social impact. Charities@Work bridges the corporate and nonprofit sectors to achieve greater social impact. Charities@Work is an alliance of four nonprofit organizations – America’s Charities, Community Health Charities, EarthShare and Global Impact – that collectively represent more than 3,000 of the leading health, environmental, international development, and community nonprofits making a difference in the U.S. and around the world today. These four nonprofits exist to facilitate interaction and partnerships between charities, companies, and their employees for meaningful outcomes and impact for all.